I learned about Decadent Creations because a friend of mine, someone who I had supervised in the past, told me that she started working there. I went to the booth at the farmer’s market simply to support a friend in her new work adventure. But I became an immediate and enthusiastic fan. My friend told me the basic story of the owner, Mindy Simmons. 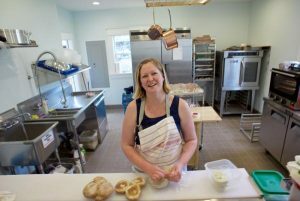 She started her baking business in farmer’s markets with the intention of growing over time and eventually open a full-service retail front. I have since watched this little business grow! More farmer’s markets, a wholesale arm selling to local stores came next, then a permanent counter in a small gift shop, even more farmer’s markets, then a remodel to a home kitchen so that Mindy could bake 24-7 (instead of in rented kitchen space), and then in 2017, Mindy opened her café and bakery maintaining the name Decadent Creations. You can visit it yourself in the middle of downtown Hillsboro, Oregon. Leveraging the connection I had with my friend who worked for Mindy, I reached out and asked to interview Mindy for a book I’m writing about leadership (that many successes can not be lucked into). When you pick up the book in the near future, you can read more about Mindy then, but for now, I’d like to tell you about one specific thing she said: “What I think about all the time is how I can structure things for people to be successful.” When she said this to me, there was conviction in her eyes and emotion in the tone of her voice. I could see that she expends a lot of energy on this one thing. Her bakery and café now employs about 10 people. She thinks about how she can structure things for every one of them to be successful… all the time! When Mindy explained this in greater detail to me, she said of her employees “I watch them every day…,” looking for when they struggle with anything; then she asks herself ‘how can I change something to make it better for them.’ She has taken personal accountability for her employees’ ability and opportunity to be successful. If her people are struggling, she takes it upon herself to help them get to where they need to be. Weak leaders tell their people to figure it out on their own, great leaders lead their people to find their success. When you visit decadent creations, you’re going to find employees who care about your experience, they care about the food they serve you, they have pride in the work they do, and they can provide you with world-changing macarons. For now, I think my favorite is the Vanilla rose… but ask me tomorrow and I might have a different answer.